Choose a job you love, and you will never have to work a day in your life. If that popular adage holds true, then Steve Engebretsen’s 38 years at Durham Academy — a span marked by countless long hours and days, and shepherding the athletic careers of thousands of DA students and hundreds of coaches — truly represents a decades-long labor of love. Dedicating your life’s work to athletics at an independent school also means handling your fair share of a little blood, a lot of sweat and (sometimes) tears. And while he’d never admit being DA’s athletic director wasn’t hard work, Steve will tell you that his job was easier as long as he kept one thing in mind. This fall, Engebretsen shared with DA faculty, staff and coaches that he has decided to step down from his role as director of athletics at the end of this school year. As DA’s longest-serving director of athletics, Engebretsen has grown DA’s athletics program to 20 sports and 47 teams, with 480 student-athletes in grades 7–12 mentored by 80 coaches. During his tenure, DA has won 44 state championships. Although he will step down as director of athletics, Engebretsen will continue at DA — teaching Middle School physical education, working with alumni engagement and overseeing DA’s bus scheduling, maintenance and driver training. After 28 years as director of athletics, Engebretsen says he feels like the time is right for a new voice, a new face and a new leader for DA athletics. Engebretsen began teaching and coaching at DA in 1981. As varsity boys basketball coach in the ’80s, ’90s and ’00s, he won 200 games and took DA to four NCISAA final fours. In 10 seasons as varsity softball coach, his teams won 131 games and four conference titles. Engebretsen has also served administratively at the state and conference level since assuming his current role. As he wraps up his career as director of athletics, Steve says he’s most proud of things he feels he had a direct hand in: the new Kirby Gym, DA’s upgraded outdoor athletic facilities, a strong and deep bench of teacher/coaches, and bringing DA’s athletic training program into the 21st century with three trainers dedicated to DA athletes’ health and wellness. But what he treasures most are the relationships he’s made along the way. Durham Academy is family for Engebretsen, both figuratively and literally. DA is where he met his wife Teresa, a revered French teacher at the Middle School, and their sons, Jake ’06 and Grant ’11, attended DA from Preschool through Upper School. For his father, being appreciated feels good, “but I don’t like being behind a microphone, I don’t need that. And it plays out in how I do my job, I downplay a lot of stuff. … I’m not big on celebrations, and I don’t need a lot of attention, but if someone gives me good attention, I’ll enjoy it and appreciate it,” he says with a smile. 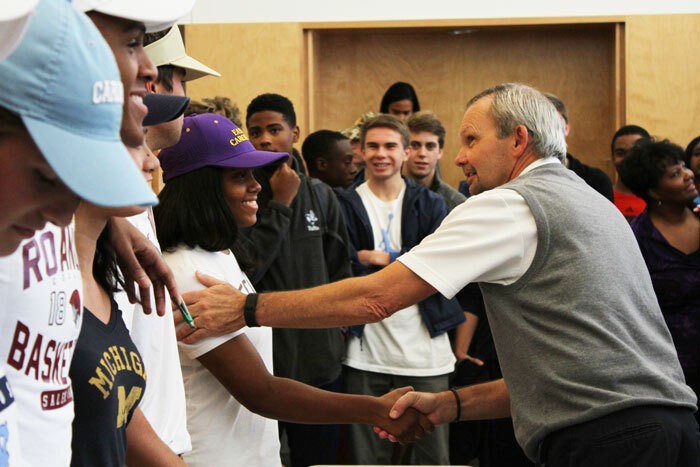 This summer, the North Carolina Independent Schools Athletic Association put Engebretsen center stage as he became one of only five athletic directors in the state to be awarded the Charles N. Carter Athletic Director Cup, named for former the NCISAA executive director and 2010 NCISAA hall of famer. The award recognizes athletic directors who have served for an extended length of time in their position and embody NCISAA values. Engebretsen served the NCISAA and its member schools for over a decade as a member of the Board of Managers. Engebretsen attributes some of his success to his ability to see the big picture, and that’s evident when he describes his overarching philosophy about athletics. DA has launched a national search for a new director of athletics, with finalist visits anticipated for December and January. The intention is to announce a new director of athletics by Feb. 1. “I’m looking forward to being a little bit more of a fan and a supporter,” Engebretsen says. “Because sometimes I feel like I don’t get a chance to be that because I’m the logistics guy, problem-solver, fire-putter-outer even when the action is fun to watch for everybody else. We asked various friends, colleagues, alumni, parents and former athletes to share some thoughts and stories about “Mr. E” and his career at DA below. 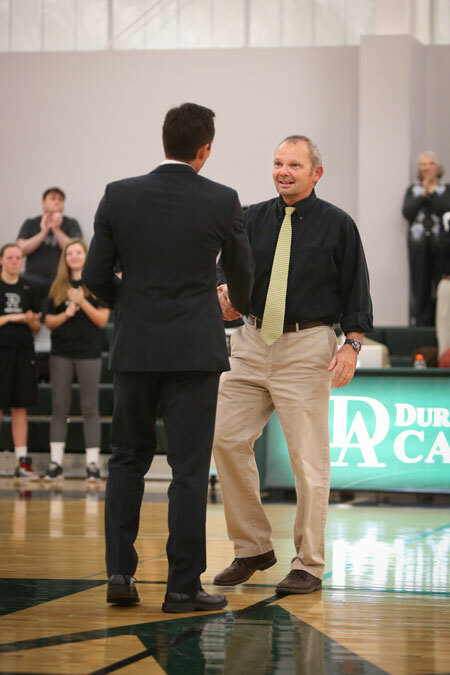 For 37 years (this is Steve’s 112th school sports season), Steve Engebretsen has invested his time, care, thought, sweat and wisdom in Durham Academy, its coaches and — most importantly — its student-athletes. Steve has taught Middle and Upper School PE, advised groups of students over their four years in our Upper School, and coached the varsity boys basketball and varsity girls softball teams. He has supervised nearly 2,000 varsity and JV teams and organized tens of thousands of athletic contests, officials and uniforms. He has ably handled thousands of challenging conversations, complaints, rainouts and reschedulings. Through it all, Steve’s equanimity, professionalism and diligence have made him the bedrock of our athletic program. I am delighted and inspired by the fact that Steve, after 38 years of service to DA, wants to keep serving DA — in particular, serving our students more directly. I love that he wants to spend more time with students. I am glad and grateful that we won’t have to say goodbye to Steve in June. I am particularly grateful for Steve’s friendship and guidance to me as a new teacher in the early 1990s — including the year I spent as his assistant coach on the varsity basketball team (my primary contribution was reducing the number of technical fouls Steve earned that year). In the nearly three decades since, I have watched Steve help me and scores of other teachers, coaches and administrators with wise mentorship and understated leadership. He shows us by example that nearly any problem can be solved with patience and hard work. He strikes the proper balance between inclusive recreation and competitive excellence. He strives for equity between boys and girls sports, between higher- and lower-profile programs. He takes keen interest in individual students, but always sees the long-range interests of the school. In part because he is still willing to empty coolers, wash uniforms and line fields, Steve deserves this highest of honors for his unique combination of humility, hard work, and practical wisdom. He is one of the most effective servant-leaders in the history of Durham Academy. When I think about Mr. E, the first word that comes to mind is loyal. When I tried out for varsity softball many years ago, I had no idea what a special relationship I would form with him. He was known as the athletic director, the coach, the bus driver, the uniform distributor, the concession stand manager, the athletic trainer, the groundskeeper, the teacher and and the man with the long stare behind the dark sunglasses. Mr. E had a reputation for no nonsense. He was a man of few words. When he spoke, everyone listened. However, it didn't take long for our softball team to get to know a much “softer” side of Mr. E. The one who, while driving the big bus to an away game would stop at a stop light, lower his glasses, look in the big long rearview mirror and give us the “look.” We knew we were in trouble! Soon though, “that look” turned to a grin, a smirk, a head shake and laugh. He even would turn up the radio at our request and smile as his team of teenage girls sang, danced and waved at passing cars. As high school students, he guided, listened, supported and cheered us on in our successes and struggles both on and off the field. As college students, he came to our reunions, invited us back to campus and emailed us to check-in. He genuinely cared about us, and his door was always open. Now that I'm back on campus, he comes to check in on me in my kindergarten classroom. Just like the old days, he has the ability to command the respect of the room. Each time he visits, I pause, I look at him to see if I'm going to get the stare, the smirk or the smile. And each time he visits, I'm reminded how grateful I am to know him and what an honor it is to call him a friend. His loyalty to both his former players and to Durham Academy as an institution is unmatched. Steve is sneakily persuasive. When I was hired as admissions director in 1997, coaching was not part of my contract. But during the opening faculty meetings, Steve found out I’d coached soccer previously and asked if I’d be willing to assist with DA’s varsity boys team. I was nervous about making such a big time commitment since I had a new administrative job, was also teaching a math class, and had a new baby at home, but he used his unique, Nebraskan charm to convince me it would be manageable. A few years later, he made a similarly successful pitch to have me take over the Middle School boys’ team. Every year since then, I tell him it’s my last one coaching, but somehow 15 soccer seasons have passed, and he’s the one stepping down. I still can’t figure out how he does it. Steve has been a true pleasure to work with over the years. He has always taken a huge amount of pride in his job and has always represented Durham Academy is a very professional manner. Steve has held many various positions and roles throughout the years, and you could always count on him to do a very efficient and effective job with the responsibilities and job at hand. We could always count on Steve to provide a “check and balance” with topics — decisions and policies that were put before us as conference ADs. He has been a good friend to all of us and a role model for not only the student-athletes at Durham Academy, but also a solid mentor and example to the young athletic directors of our state association. Steve is quite simply the best student-athlete/coach advocate I’ve ever been around. His understated leadership style makes you want to try a little harder. The best compliment I can give Steve is that he is a doer — no matter what needs to get done, it gets done. 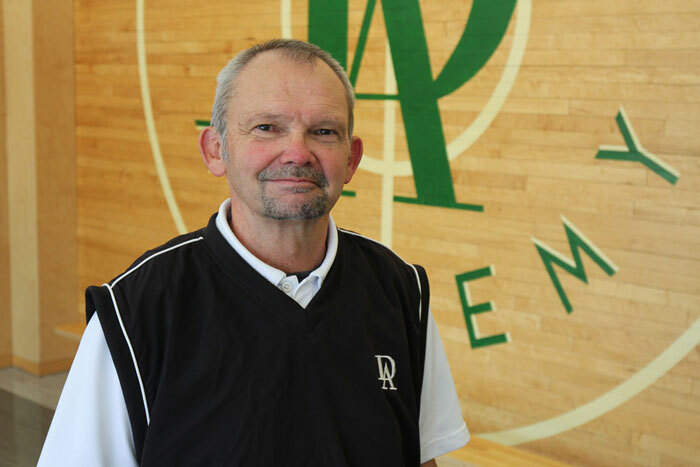 We will get a new AD but it will be really hard to replace what Steve means to DA athletics and what he does and has done for generations of coaches and athletes at Durham Academy. Steve is an unsung hero for the many tasks he does for our athletic department. He is always around lining fields, sweeping the floor at the basketball games, checking on what each team needs if multiple events are on campus. As a basketball coach for my brother Tom and me, he was a great motivator and coach who expected your best in both practice and games. Steve’s best quality is he takes his job and Durham Academy athletics personally. He strives to have a great program, but even if a team loses or has a challenging season, he appreciates the effort. Throughout his tenure, Durham Academy has excelled on the court and field, and his efforts are a major part of that success. I have very mixed emotions about his retirement. I will get more of his time, especially in the summer, so I am very happy about that. I know how much his coaches love him and how devoted he is to making the best possible experience for our student-athletes. He always keeps them first and foremost. The first meeting I had with Steve was memorable. He said, ‘I don't want to do this job forever.’ Nineteen years later, he got his wish. As DA's athletic director, Steve oversaw the growth and development of a wonderful athletic program. It is kid-centered and gender-neutral, thanks to him. He always lobbied for improved facilities, but most importantly he saw the big picture. How many other ADs have had to stand at the bathroom door in the gym at halftime of a basketball game and tell people they couldn't go in because the teams were in the locker room where the bathrooms were? The gym renovation was the last thing on our list, but at least it happened on Steve's watch. He was a wonderful advocate for his coaches, and he was willing to make tough decisions. He was a great asset to the administrative team. He worried about everything, much to the benefit of the school, although it took its toll on him. He was often the first person on campus and nearly always the last to leave. He also earned the respect of all the other ADs and school heads in the state. He is also a very compassionate man. Steve is a great friend and athletic director. I knew as a coach, he was completely loyal to me. He worked so hard behind the scenes and did the grind work no one could see to make the athletic department successful, but his coaches knew their jobs were better because of him. I will miss him next year. Steve has always been so supportive of me and our boys basketball program. He understands what it means to be a coach and appreciates all the time and effort that goes into building a program. I will miss him being in the gym during our practices and games to bounce ideas around and to listen to his wisdom. Steve is not just my athletic director, but also a true friend. Thanks, Steve, for all you have done for DA! It’s truly impossible to pick out just one moment as my favorite from my father’s time as athletic director. Growing up the son of Durham Academy’s AD was perhaps the most fun and exciting part of my childhood. From raking the infield after baseball games to late night trips to shoot hoops in an empty gym to riding the team buses, playing games to pass the time, I never once considered the fact that my dad was working long, stressful days. To me it was just spending time with the coolest dad in the world. Many years after high school, after I had been a full-time teacher and had various other full-time jobs, I reflected back upon the special people from my childhood, my former coaches and mentors. I remember having a kind of epiphany about the gifts these individuals had given me. Coach E. was one of these special people. The amount of time he spent with me and my fellow teammates in the gym and driving us to away games and to tournaments is truly astounding. To know that he did this above and beyond his full-time job is what I find most impressive. That level of dedication and generosity of spirit towards the student-athletes of Durham Academy over more than three decades is one of the most admirable accomplishments I can imagine and will always be deeply appreciated. Everywhere I go representing DA athletics, whether it is at a conference, a meeting, or just a sporting event, athletics administrators from other schools talk so highly of our program and always say how we are the gold standard of private school athletics. This is completely due to Steve's tireless efforts to make sure that we represent Durham Academy with class and always do the right thing. His impact can be felt both internally from our students and coaches and externally from those in similar positions around the state. Thank you, Steve!